A list of issues follows the section of macro-related information that is immediately below. In a continuing effort to improve Script Werx, maintenance updates are available to all holders of a current license agreement, from our password-protected Update Download Page . You can request a password by e-mail or phone ( 952-8102). A password will be provided once you are confirmed as holding a current license. Macros add functionality (features). They are like small computer programs that augment the underlying application (in this case, Word). Malicious hackers have discovered that macros are an effective way to spread damaging computer viruses. To defend against this, software applications now include features that identify when a macro is about to run and provide the option of disabling macros. Bugs in Version 11, released 7/04. Character Cues Disappear in a screenplay-format script, causing action to be pulled into dialogue, after using Repaginate (on the Script Werx menu). Import Script does not work. The Import Script procedure (on the Script Werx menu) does not complete and locks up Word. Import Script does not work see "Bugs in Version 11." Features don't work: when clicking a button on the Shortcuts toolbar or selecting an item from the Script Werx menu, nothing happens. Part of script does not print out when working in a two- or four-column script. Missing Templates Script Werx Templates do not appear when going to the File menu and selecting New (or Project Gallery). Script does not attach to a template This usually happens after moving a script between computers. Character Cues Disappear see "Bugs in Version 11." Installer indicates that Microsoft Word is not installed when Microsoft Word 2003 is installed on the computer. Some keyboard shortcuts don't work as the user guide indicates they should. Two-Column Version Cannot Be Created when working in a four-column script. Script will not open on a Macintosh. "Incorrect Install" dialog box appears. Borders outside the printable area. When printing a script from a Macintosh, an error message is displayed. Compile Error When Applying Line Numbers when working in a two-column script. Dialogue appears without a character name: when creating storyboards from screenplay format scripts. Four-Column Version Cannot Be Created when working in a two-column script. Invalid path error: When trying to create a storyboard or a report such as a prompter list or scene list, an Invalid Path error occurs. Run-time error when trying to import an existing script in screenplay format. Script Werx Templates do not appear when going to the File menu and selecting New (or Project Gallery). There are multiple Templates folders on the hard drive and the Script Werx templates have been installed into the templates folder not being used by Word. The installer for the current Windows version of Script Werx has been redesigned to virtually eliminate this problem. However, should this problem occur anyway, first, run the installer again. If the problem persists, you may want to consider the Re-Point procedure described below. Using the Macintosh version of Script Werx, any of the three procedures below will work, but the easiest choice would be to move the templates using the Template Mover utility. Move Templates --Download and run the Template Mover utility, which will locate your Script Werx templates and move them into the correct Templates folder. Click here for additional information and download access. Reinstall --(won't work for version 10 or above of Script Werx (huh?) for Windows) Determine which Templates folder is being used by your installation of Microsoft Word and then reinstall Script Werx into that folder ( first set of instructions below ). Re-Point --Point Word to the Templates folder in which the Script Werx templates are already installed ( second set of instructions below ). Reinstalling may be safer because you are not changing where Microsoft Word looks for its Temples. However, running the installer again may take longer. If you are using other templates, or have modified your Normal template, this would be the best choice. Re-pointing Microsoft Word to your existing installation of Script Werx templates may be quicker, depending on how long it takes your computer's Search or Find tool to locate the Script Werx templates. Reinstall Script Werx into the Templates folder being used by Word. From the Tools menu, select Options (In Macintosh 98 Preferences ; in Macintosh 2001, on the Edit menu select Preferences ). Under File Types , find User Templates and click once to select it. Cancel out of both dialog boxes.  Reinstall Script Werx templates into the Templates folder being used. On the File menu, select New. From the Tools menu, select Options (In Macintosh 98 Preferences; in Macintosh 2001, on the Edit menu select Preferences ). Use the browse box to select the appropriate Templates folder. Click OK to close both dialog boxes. Move the Script Werx templates from where they have been installed into the Templates folder being used by Microsoft Word. From the Word menu, select Preferences (on Windows, from the Tools menu, select Options). In Finder, from the File Menu, select Find, then use the Find dialog box that opens (In Windows, click Start , then use Find (or Search)) to locate the Script Werx templates. Look for a template name such as -Storyboard Template.dot.  Open the folder containing the Script Werx templates. Find and open this folder.  Find and display on your computer screen the Templates folder where the templates should go. Use the path you wrote down in the first step of this procedure to find the Templates folder being used by Word. Arrange the items on your computer screen so that you can see both this Templates folder and the Script Werx templates.  Select all of the Script Werx templates and drag them into the appropriate Templates folder. Select all 13 Script Werx Templates (listed in chapter 1 of the user guide under What's Installed; Script Werx versions lower than v10 will have only 12 templates). Drag all Script Werx templates into the other Templates folder. In Word XP only, a New Document screen may appear, click New from Template > General Templates. All Script Werx templates should now appear. in a screenplay-format script, causing action to be pulled into dialogue, after using Repaginate (on the Script Werx menu). Or you may not readily understand what went wrong, but the script format is "all messed up." Some type of action happens. The character continues speaking, after being interrupted by the action. This was caused by the Repaginate command assuming that any character cue followed by "(CONT'D)" must be part of pagination marking and should be deleted before a fresh repagination is performed. This should not occur when using the feature-film-format indication for continuing dialogue (the word "continuing" under the character cue as a parenthetical direction) or if Repaginate (Script Werx menu) is not used. Download and install the current maintenance update, or use any version of Script Werx that is 11.1 or above. Problem: Import Script does not work. The Import Script procedure (on the Script Werx menu) does not complete and locks up Word. This is caused by one of those "Microsoft knows best" features that overrides what you--or in this case, our software--fully intends to do, without any warning. Turn off the feature and try again. The Script Werx template will remember all of the character names that you have already entered. On the Word menu, select Preferences (on Windows, from the Tools menu, select Options); then select Edit. Deselect (click to remove the check mark in front of) Smart Cut and Paste. Click OK to close all open dialog boxes. You should now be able to import an existing script. And any character names you entered during a previous attempt will be entered into the Character Names dialog box automatically. This has been corrected in our current maintenance update and on all versions of our software beginning with version 11.1. Problem: Option to create a clone template is not provided when names have been added to the Character Toolbar and you start to create a new script. Problem in the computer code that runs when creating a new script. On the Script Werx menu, select Preferences. In the Script Werx Preferences dialog box, locate the Opening Tutorial area. Click the radio button for Don't give tutorial option. Now, when creating a new script from a template that has names added to the Character Toolbar, you will be offered the option of preserving that template with the Character Toolbar intact and creating a clone template with a blank Character Toolbar. You can turn the tutorial option back on at any time by returning to the Preferences dialog box. on a Macintosh on which Script Werx is not installed. This may occur regardless of whether the script was created on a Windows or Macintosh computer. An AutoOpen macro (computer code that runs automatically when a document opens) uses the Windows name of the Normal template (Normal.dot) rather than the Macintosh name (Normal). This macro normally helps a script find and attach to the appropriate Script Werx template when the script is moved among different computers. This needs a two-step solution: Fix existing scripts; stop the problem from happening again. In the Macros dialog box that opens, make sure the Macros in: field displays the file name of the script from which you want to delete a macro. A single macro, AutoOpen, should display. The name of the macro (AutoOpen) should disappear. Stop the problem from happening again  obtain a free maintenance update or replace the currently installed template file named Template Attach Tool.dot with one of the following downloads (appropriate to your computer). For Macintosh this is the copy of Template Attach Tool.dot to download. For Windows this is the copy of Template Attach Tool.dot to download. Find the Script Werx templates on your hard drive: On Macintosh use Sherlock. On Windows, click Start, then Find (or Search). Then locate a file named Template Attach Tool.dot. Replace this with the new version of this file (which may need to be extracted from the file you download, in which case it can be extracted directly into the folder you identified in step 1). The file names should be identical, so if dragging (or extracting) the new file into the Templates folder, you will be asked if you want to replace the existing file. Click OK.
even though Microsoft Word 2003 has been installed on the computer. This problem should not occur with Microsoft Word versions 97 to XP. Script Werx installers prior to v10b2 do not know to look for the 2003 version of Word. Obtain a free Script Werx maintenance update. Note that even though the installer does not work correctly with Word 2003, the Script Werx software being installed does. This means that if Script Werx is installed for an earlier version of Word (97, 2000 or XP), and then Word 2003 is installed on that same computer, Script Werx should continue working fine. Problem: When pressing some of the keyboard shortcuts indicated in the user guide, nothing happens. Some keyboard shortcuts were lost during an early revision of v10. On Macintosh, Microsoft Word's Page Border feature does not work correctly with many printers when the option is chosen to measure the border from the edge of the page. Either remove the border by clicking None (in the upper left corner under Setting ), or to move the border within the printable area, click the Options button. In the Border and Shading Options box that opens, in the drop-down list next to the field labeled Measure from, select Margin. Enter the numbers for distance from the different margins. This will take some experimentation. Try starting with 20 pt for all four measurements. Click OK to close out of all boxes. Script Werx templates have different names for their Macintosh and Windows versions (done to keep the Windows version backwardly compatible with earlier version of Windows which would accept file names with no more than eight characters). So when a script created on one platform is moved to the other, it tries to attach itself to a template name that does not exist, and by default attaches itself to the Normal template. On the Tools menu (File menu for versions of Word older than Word 97 or 98) select Templates and Add-Ins. A dialog box will open. Click the Attach button. A browse dialog box will open. Use the browse dialog box to select the appropriate Script Werx template. Click Open to close the browse dialog box. Installation Option : Word 2001 now provides a My Templates folder within its Templates folder as a place to store templates you create or purchase (such as Script Werx ). We recommend that you do not use it for Script Werx templates. Although there is no technical reason not to store Script Werx templates in this new folder, doing so creates an extra step when starting a new script and our Script Werx documentation assumes that our templates are kept loose in the Templates folder rather than stored in a folder within this folder. File Menu Change : On the File menu for 2001, a Project Gallery menu item has replaced the New menu item. This means that when starting a new script, you need to choose Project Gallery in order to get access to Script Werx templates. The current maintenance update of Script Werx for Macintosh includes all revisions needed to work correctly with Word 2001. It is available for download by any registered owner of Script Werx. 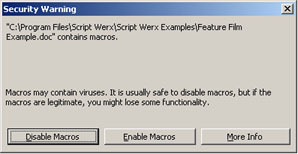 On occasion, some virus protection programs, especially from lesser-known companies, mistake some of the more complex macros within Script Werx for a virus. A reason behind this is that Microsoft Word macros are a common means of spreading viruses. In an effort to err on the side of caution, false positives are fairly common. In three instances, Script Werx has triggered false positives. At no time has any Script Werx template actually carried a virus. Before release, Script Werx software is checked using the most current virus detection software from Virex or McAfee and at no time has a virus been detected. Reinstall Script Werx from your original master disk or installer. Then see if the presence of a virus is still indicated. If so, contact the maker of the virus detection program (or check their web site) to see if they are aware of false positives being triggered by Microsoft Word macros. If not, contact technical support here at Parnassus Software (818) 952-8102. We will follow up with the maker of the virus detection software to determine why it is indicating the presence of a virus. When clicking on Script Werx toolbar buttons or selecting items on the Script Werx menu, nothing happens, not even an error message. Multiple scripts open --If scripts in more than one format are open at the same time (example: a two-column script and a four-column script) features common to both may not work. This means that it is good practice to have only one script open at a time. Disabled macros --Macros have been disabled during installation of Word. In the interest of preventing the spread of viruses carried by macros, Microsoft now makes it possible to render Word 98 and above incapable of running any Macro; furthermore, the language that presents this option during the installation makes this sound like a pretty good idea. On Macintosh, this problem can also be caused by corrupted preference files ( see below ). Multiple scripts open --Make sure that all scripts that are open are attached to the same template (example: all open scripts use the feature film format). The use of features is lost only when scripts attached to different templates are open at the same time. Although this can be frustrating enough, no other problems are caused by having different-format scripts open and in no case is there any damage to the files themselves.  Create a new blank document  From the File menu, Select New and then click OK.
By default, this new document will be based on the Normal template, meaning that Script Werx is now in no way affecting the behavior of Word. To be sure, on the Tools menu, select Templates and Add-Ins. In the dialog box that opens, in the field for Document Template, the word Normal should appear.  Try to create a new macro. From the Tools menu, select Macro, then Macros from the popup menu. Type in a name for the macro (such as "test"). If this does not allow you to create this test macro, the macro functionality for Word has been disabled. when working in a four-column script. Instead, a "...name or path not valid..." (Err = 1055) error occurs. The upgrade to version ten of Script Werx for Windows included changing the names of the templates from eight-character names to more meaningful names (example: -2Column.dot to -Two-Column Template.dot). The code in some of the first version ten installers was not appropriately updated to the new file name. Find the Script Werx templates on your hard drive: Click Start, then use find (or search) to locate a file named -Two-Column Template.dot. Copy this file (right click and from the pop-up menu, select Copy ). Paste the copy into the same folder (with the same folder still open and no file selected, right click, then from the pop-up menu, select Paste) . Rename the file -2Column.dot (right click the new file [copy of -Two-Column Template.dot] and from the pop-up menu, select Rename. Then type in -2Column.dot). Do not forget the hyphen in front, this is critical. Close the folder and all should now work fine when creating a two-column version of a four-column script.  Open the Storyboard template. 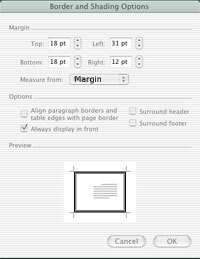 The Script Werx Storyboard Template should open. Delete the style named Character. On the scrolling list of styles, click once to select the style named Character. Click the Delete button to delete the style. Close the template file, saving changes.